The American Revolution is celebrated by many as liberal democracy’s inaugural triumph, a conflict that, in Lincoln’s words, “brought forth on this continent a new nation conceived in liberty and dedicated to the proposition that all men are created equal.” This romantic narrative of the revolution still enjoys tremendous political currency, as the Right continues to deploy the memory of the Revolutionary War in the service of its agendas, from Tea Party tax paranoia to accusations of bureaucratic tyranny. More than anything, the American Revolution is celebrated as confirmation of American exceptionalism — a moral, political, and military victory so absolute that it justifies (and indeed mandates) two hundred years of American expansion across the globe. On the Left, as well, there is the temptation to claim the tradition of the American Revolution; the story of beleaguered colonists standing firm against the British monarchy’s economic tyranny makes for a convenient political allegory. But the actual politics of the American Revolution are too often obscured by these kinds of self-serving reinterpretations, argues author William Hogeland. The American Revolution was not a noble war fought in the service of progressive democracy, destined to irrigate the entire planet with its ideology of inalienable freedoms. Nor was it a social revolution from below. Rather, it was the first chapter in an inter-imperial war between Great Britain and its dissident elites in North America. And the American state, even in its earliest incarnations, was more concerned with limiting popular democracy than securing and expanding it. In his books, Hogeland makes strides towards demystifying this history, recovering the politics that have been evacuated from the American revolutionary mythology. In recognition of the Fourth of July — a day marking the adoption of the Declaration of Independence by fifty-six prominent property owners — Jacobin‘s Jonah Walters spoke with Hogeland about taxation, the struggles of American Indians against the early US state, and the radical working-class movements that may have promised a better, more equitable America had they not been violently suppressed by the revolutionary elite. To many on the Left, the American Revolution can be interpreted two ways — either as a reactionary power-grab by colonial elites who wanted to secure their control over a slave economy, or a bourgeois revolution in which the projects of economic liberalization and representative democracy were deeply intertwined and new state-formations innovated in the service of egalitarian goals, something of a clumsy rehearsal for the French Revolution. Our favored categories can start to look strange when we turn a light on the realities of the American Revolution. The revolution involved coalitions of people who were deeply divided regionally, economically, socially, politically, so anything the big-time founders did agree on will be pretty revealing. I’d say they were largely agreed on the virtues of representative government — it’s what they’d had for generations, what they saw being threatened — but to question your question somewhat, I’d also note that across the board, from the planters to the financiers to the upper farmers and lawyers, the right of representation in no way equated with democracy, which at the time would have meant “manhood suffrage”: disconnecting the right of political participation from property ownership. The founders who held power were agreed in their fear and loathing of that idea. Their ideology of rights and liberty was bound up, from ancient times — at least in their minds it was — with protecting property. So both the economic liberalization promoted by the high-finance Hamilton, and the more agrarian program that the slave-economy Madison advanced (once he realized what his old friend in nationalism Hamilton was up to), recoiled from democracy, a term the founders used negatively whenever they referred to placing power in the hands of the unpropertied. That free yet unpropertied class was big, by the way, in founding-era America. In my view, egalitarian goals, as you’ve put it, were not on the minds of any of the well-known founders, for all of their other differences. That includes mutually divided nationalists like Washington, Hamilton, Madison, and Adams and state-sovereigntist, anti-nationalists like Patrick Henry. Is there a “revolutionary tradition” in the United States that the Left can somehow salvage? Can we draw any lessons from the American Revolution as we think about the possibility of radical transformation today? I find it impossible to draw the sort of lessons from the revolution that many on the Left seem to hope to draw. Most of the lessons I see are negative, which doesn’t make them useless, as far as I’m concerned — quite the contrary — but the American left generally hasn’t seen things that way. A lot of intellectual energy has been expended trying to ground the Left in a positive view of aspects of the American Revolution, and in other successes of American history, defining leftism itself as patriotically and even exceptionally American (“Communism is 20th Century Americanism,” etc). It’s natural, in the face of a virulent attack from right and center, scourging the Left as un-American, to try to go hyper-American. But that’s only led to a lot of naïve and faux-naïve history, intellectually insupportable as far as I’m concerned. It’s hard for me to see how that kind of history could lead, long term, to any new clarity in thinking, which I’d see as important to making real change. When all the real lessons are so painful, what are you supposed to do with them? There’s a compelling quandary regarding the Left and our revolutionary and founding history, and it shouldn’t be wished away. Here’s a negative lesson of the revolution. The elite founders I was discussing were by no means the only contributors to the revolution. Artisans, laborers both rural and urban, tenants, poor farmers, etc, were all key to the effort; often they led the way. They hoped the revolution would lead to improved political equality, as they defined it, which mostly meant for white men. They often cast their ideas and actions in the elite Whig terms of the day — liberty, rights, “ancient” charter freedoms — but in fact they took a radical view, in that they wanted to disconnect political privilege from property. Radical, because that was a sharp and total break from the long past on which the elite leaders based the right of revolution itself. Radical because these leaders of a working-class movement wanted new governments to limit the power of wealth, favor labor over capital, favor debtors over lenders. They were levelers, socialists. None of the famous founders agreed with them, and the movement, though crucial to the revolution, was crushed. I’ve analyzed the formation of the nation itself, at the end of the 1780s, as motivated almost exclusively by an elite program of crushing American socialist tendencies. Well, that’s not a very happy story for the American left to tell about its early history. So we don’t talk much about leaders like James Cannon, Thomas Young, Christopher Marshall, or Herman Husband, or about the Committee of Privates, which organized the entire white working class of Pennsylvania in a successful revolution (briefly) against elite privilege in that state. Instead we’re always trying to cast one of the Adamses or Hamilton or Madison or Franklin or Jefferson, those famous elite leaders, as half-unaware proto-leftists and arguing about which one to lionize. That story keeps eating its own tail. Of course some left historians do talk about the real leftism present at the founding. Without Gary Nash, Woody Holton, Terry Bouton, Wythe Holt, Ray Raphael, Jesse Lemisch and others, I wouldn’t know about this stuff. But few of those historians get across to the public, and those who do seem to me to turn away from the harshest conclusions of their stories, even while showing what really happened; they try to make that early leftism essentially, even exclusively, real-American, and they call for reviving it as such. A colder-eyed view, inspired by a left economic critique, suggests that the crushing of that movement was in the end far more fully wired, structurally, into the national founding than the left ideas that got crushed. So I prefer not to see anything as essentially American or un-American. I prefer to imagine we’re free, within reason, to do what we think is right. Having to cast every good idea as a expression of the American Revolution just wears us down. In what ways, if any, was the American Revolution an anti-imperialist war or something of the first chapter in an inter-imperialist one? Regardless of some of the founders’ ideological preferences, the War of Independence certainly was the first chapter in the rise of American imperialist warfare. People like to cite Washington, when he was president, on avoiding foreign entanglements. That represents what I see as a widespread fantasy that there could ever have been an independent American nation without expansion driven by a concentration of wealth and military power. That’s what nationhood meant — and that’s why, if we want a radical transformation, we have to stop seeking it somewhere in our national origins. Washington somehow managed not to see his conquest of the old Northwest in the 1790s as a foreign engagement, because the enemy was indigenous. Neat trick, but in fact many of the men who became revolutionaries, with Washington among the foremost, turned against England in the mid-1770s precisely because the mother country was blocking their expansion into Indian country, “robbing” the colonial speculators of their investments and of the massive potential profits to be made there. 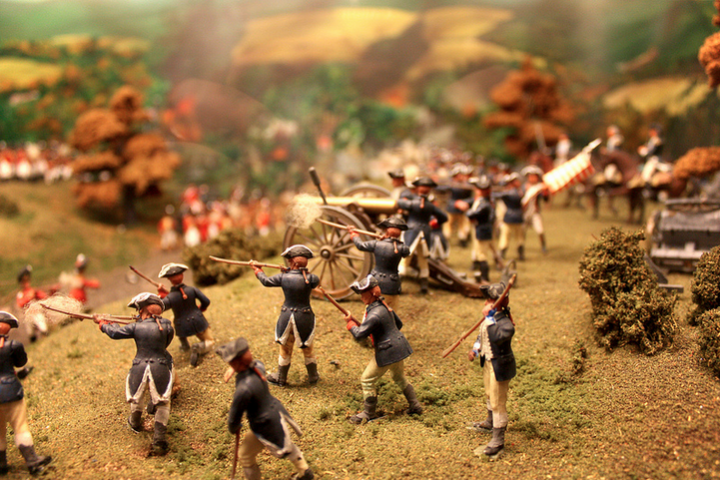 In the west, at least, the revolution was a war of American expansion. Then the Northwest Territory, Indian country ceded by England in 1783, became the emerging nation-state in embryo: run by the federal government before the federal government could run anything within the states themselves. To really establish ownership of that territory took a new war against a mighty confederation that few talk about today. That Indian confederation handed the new nation the worst defeat it ever suffered at native hands, far worse than what went at the Little Big Horn later on (Colin Calloway has a book out now on that early Indian victory). In the context of that war, a US military establishment was born. A century or so later, the entire swatch of continent was at last under US control and ownership, and the Caribbean and the Pacific beckoned. Teddy Roosevelt was not wrong, in my view, to see Anthony Wayne, the conqueror of what is now Ohio and Indiana, the first victorious US general, as a guiding spirit for vigorous global US expansion in the twentieth century. I’m finishing a book right now on Wayne, the Indian confederation, that little-discussed, all-important founding war, and the politics of forming the US Army. Let’s talk about taxation. “No Taxation Without Representation” has proved a lasting slogan, and the memory of the revolutionary war is routinely deployed by the Tea Party and other elements of the small government, anti-tax right. But the Revolution also ultimately established a federal government with the power to levy taxes on goods and incomes (including the hated “whiskey tax”), established a national treasury, introduced tariffs and trade restrictions, etc. So what was the relationship between the rebelling colonists and taxes? In my view, pace Grover Norquist et al, the founders were not in favor of zero or little taxation, zero or low public debt, and “government small enough to drown in a bathtub.” Some of them were, but as you note, one of the main points of writing and ratifying the Constitution was to enable a powerful federal bureaucracy to collect taxes. Unlike the late Edmund Morgan, who spent much of a long and important career trying to prove otherwise, I see the ideology of the revolutionary generation regarding British-imposed taxes as erratic. John Dickinson, however, expressed a consistent and meaningful position: even though Americans didn’t send elected representatives to Parliament, it was okay, Dickinson believed, for Parliament to lay taxes and tariffs on Americans for the purpose of balancing trade throughout its empire. But it was not okay to lay such levies for the purpose of raising revenue for the treasury, unless those taxed consented to the tax, via representation. That seems like an abstract distinction to us, but it wasn’t to them. While Dickinson opposed American independence, he was among many willing to fight and die for the principle, which goes back to the ineluctable relationship, for the elite revolutionaries, between property and liberty. Government can’t take your property without your consent, which is given through representation. If it does, you have a right of revolution within the English constitutional framework. When Thomas Paine — one of the few founding-era radicals anyone remembers today — mocked the English constitution in “Common Sense,” he was mocking the very basis that the elites had claimed for fighting England. That’s one reason John Adams so loathed Paine. Now, the first US tax, which the Constitution was created in large part in order to collect, was earmarked to support a large public debt. Hamilton saw nationhood in terms of public debt, and he’d worked hard throughout the 1780s to grow, not reduce, the domestic war debt: in that debt he rightly saw seeds of nationhood. He funded it, famously, which meant paying nearly 6 percent on face value of multiple tiers of bonds bought from the federal and state government by a small group of wealthy American investors throughout the war. Contrary to loose talk then and now, the blue-chip tier of that debt changed hands very little, as E.F. Ferguson showed long ago. Hamilton wanted to yoke those rich investors’ financial gains to the national interest, concentrating American wealth in big national projects. It was a huge bailout, and it worked. But you claim the Whiskey Rebellion — a populist insurrection that took place during President George Washington’s first term in response to an excise tax on liquor — represents something else. What were the politics of the Whiskey Rebellion? And what does it tell us about the American state in its first years of its existence? The so-called “whiskey rebels” — Hamilton called them that, in order to erase their real critique — objected to Hamilton’s plan, which linked private gains to the national interest and thus preserved the status of the wealthy elite in the young republic. Like Dickinson, the rebels too are often wrongly viewed as objecting to taxation itself. They really objected to what they called “unequal taxation”; they wanted progressive tax rates. These were the 1790s version of the radicals of the 1770s whom few remember. Their industries in the west were being sewn up by local rich cronies of nationalists in Philadelphia. In some ways I think their rebellion should be seen as a very ambitious labor action. It’s also important to know that the whiskey rebels were not diehard antifederalists, as Pauline Maier presents them in her great book on ratification. In fact, many of the rebels harbored high hopes for a national government; they thought it would be progressive. When they saw that its tax provisions enabled a bailout of the wealthy few at their direct expense — they weren’t “paranoid,” Hamilton really was trying to shut them down economically — they ultimately threatened secession, hoping to start an economically radical state west of the Alleghenies. Washington and Hamilton took 19,000 troops to occupy western Pennsylvania, subjected the citizenry at large to door-kicking mass arrest without warrants, detained people without charge, extracted mass loyalty oaths, etc. So there’s another weird tale of the fate of founding-era American leftism. When I say our early radicalism was crushed, I mean it literally. With that engagement against the whiskey rebels, and the victory of Anthony Wayne over the Indian confederation — US sovereignty established — we might see the American Revolution as fully accomplished. The speculative capital investments of a small group of rentiers (and wannabe rentiers) and industrialists — some of that ambition dated back at least to the 1760’s — were now secured by the might of an emergent, expansionist nation state. That’s depressing if we’re looking to our revolutionary origins for models of the kind of radical social and economic transformation we’d like to bring about. But I really think it’s our failure to live with the full range of painful founding realities — our constant efforts to explain them away or appropriate them ahistorically to our ends — that obstructs change, and I’d like to revolutionize that situation. William Hogeland is the author of Declaration: The Nine Tumultuous Weeks When America Became Independent and The Whiskey Rebellion: George Washington, Alexander Hamilton, and the Frontier Rebels Who Challenged America's Newfound Sovereignty .